View More In Oat Flour. 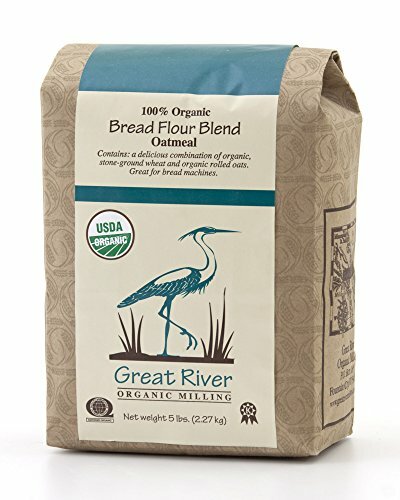 Great River Organic Milling is located on the upper Mississippi River, in the heart of what is called the Hiawatha Valley. The natural beauty of the area is a constant reminder of the importance of our commitment to organic agriculture. Organic, or sustainable agriculture is more than the avoidance of chemical fertilizers and pesticides. An organic farm strives to protect our environment by building and maintaining healthy soil which, in turn, improves water and air quality. It has been shown that grain and other food crops grown in a healthy soil, resist pests and diseases better than conventionally grown crops and also contain more vital nutrients important to humans. Consuming organic foods promotes the health of individuals and the land on which it was grown. In supporting organic agriculture we promote the cycle of a healthy environment which includes the lives of microorganisms, plants, and humans. Most Great River flour is stone-ground. We believe the natural granite millstones contribute to the quality, taste and nutritional integrity of whole grain flour. Grain flowing into the stones becomes very thin, flat flakes which integrates all parts of the wheat immediately into the flour, allowing the flour to have more flavor. The cooler temperatures that occur during milling with stones allows important enzyme activity to continue. Protein levels are also be maintained. Our stone-ground flours are milled to order, to retain the nutritional value of the flour. Great River is Certified Organic by Quality Assurance International and Kosher approved. Obtaining our certification requires a yearly inspection of our milling facility and records to insure that our products meet industry standards. If you have any questions about this product by Great River Organic Milling, contact us by completing and submitting the form below. If you are looking for a specif part number, please include it with your message.